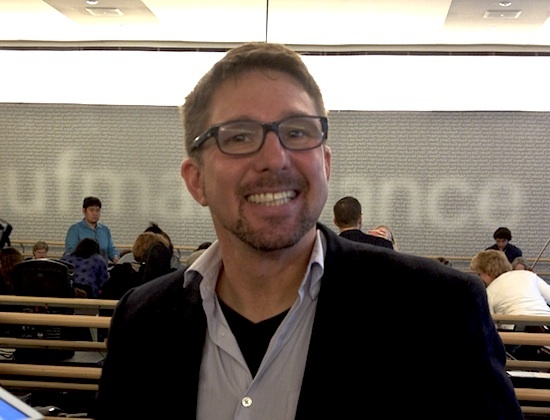 Michael is a composer, violinist and pedagogue who teaches at the Colburn School in Los Angeles. His compositions have included tangos, solos for young violinists, pieces for young ensembles as well as a violin concerto called Elements, which was recorded with violinist Brian Lewis and the London Symphony Orchestra in 2006. More recently, he just finished a viola concerto. Michael's lecture at the Starling-DeLay Symposium on Violin Studies at The Juilliard School was called "Bach to the Basics: An In-Depth Look at the Compositional Genius of Bach's Solo Works for Violin." Why do we want to look more closely at the Six Sonatas and Partitas for Solo Violin by Bach -- these epic works that Bach wrote for unaccompanied violin? "This is the nicest car you're going to drive in," Michael said of the Sonatas and Partitas. "To really access the full potential of it, you have to get out and take a look under the hood." That means harmonic analysis, rhythmic analysis, textural analysis, phrasing, voicing…. But look at Michael. Music theory appears to make his very soul glow. I've played it for many years now, but I still remember my thought, when my teacher assigned it to me: "Are you kidding, I'm supposed to figure out THAT?" Michael simplified it a great deal. He pointed out that, in Baroque music, the music is not going to travel to a terribly distant key. "In C major, you aren't going to get to F# minor in Baroque music." Most likely, you'll flow through the keys built on the first six degrees of the scale (though not likely in that order): I, ii, iii, IV, V and vi. The G minor Adagio pictured above, is really like a chorale, when boiled down to its harmonic essence. 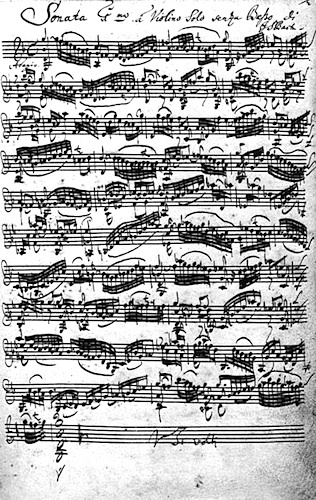 One can think of this Adagio as a prelude to the second-movement fugue that follows it, and this is true for all three of the Sonatas: the first movement is a prelude to the second-movement fugue. "It's basically descending, step-by-step," he said of the bassline. If you take away all the ornamentation and fill in the other lines, which he calls the upper and lower treble, you get that "chorale" kind of feel. Below, Michael has the class play his "Reduction" of the Adagio from solo Sonata No. 1 in G minor. "This is highly ornamented music, over that structure," he said. "The voices continue throughout -- it's not random." Knowing this harmonic structure, one can see that, for example, m. 9 is a huge harmonic arrival, a cadence in D minor, the dominant. At m. 12 comes a deceptive cadence; instead of cadencing in E flat, Bach sets up a diminished chord that eventually leads to a cadence in C minor in the next measure. At m. 14 is a recapitulation of the beginning, in the subdominant. Michael laid them over one another, with the beginning on the top line and the recap on the second line -- check it out! One can kind of hear this, but if you really look at the music, the recapitulation goes on for nine measures, in a very parallel fashion, all the way to the end of the piece. "This is the exact same music!" Michael said. Pointing out these fairly simple cadences and repetition of melodic material can be a way to open the discussion with students about music theory. Michael also talked about the next movement of the G minor Sonata, the fugue. He had us listen to the organ version of the fugue, which is actually in D minor. "When you see the organ part, a lot of the voices are filled in," he said. In the violin version, because of the limitations of the instrument, many times the voices are implied instead of actually played. We also looked at the Andante that is the third movement from the Sonata No. 2 in A minor -- a favorite for me. "It's basically a melody with a pulsing bass line," Michael said. "Bach does not always have to be complicated -- he was a great tunesmith." The dynamics in this piece are determined by the shape of the melodic line, getting louder in ascending passages and quieter in descending. Bach does create some drama by changing the pace of the harmonic rhythm, that is, how long one stays on any given chord. He slows the harmonic rhythm for a hemiola in m. 6, heralding a cadence. "It's like coming to a red light," Michael said, you slow down before you come to that stop, which is the cadence. At the second ending, that ever-present pulsing in the bass line actually stops, to hold the cadenced note for three full beats. Michael said it was as though "Bach is taking a walk in the garden, he sees something beautiful, and he stops." The melody is important in this movement, "but the bassline is driving the car," Michael said. "The melody is just along for the ride -- in a very pretty dress!" We can nudge along areas of harmonic interest along the way -- such as those cadences and hemiolas, and this is how "theory can help us make some musical choices." And how can we not talk about the E major Preludio? This is the first movement of the Partita No. 3 and one of the most-recognizable of the Sonatas and Partitas. But did you know that Bach also transcribed it for an orchestrated organ version, complete with trumpets, timpani and instruments that I can't confidently identify? "I love it!" said Michael -- several times -- as we listened to this version in class. Here are a few theory points to note: the underlying beat pattern emphasizes the second beat (just look at the first measure!) The piece begins with a two-octave sweep going down, then the first six measures are repeated in the inversion (the register is reversed). Bach also works on many rhythmic levels, if you look carefully at m. 29. The third movement of the same Partita (No. 3 in E major) is the "Gavotte en Rondeau." "Here, the Rondeau is used structurally as a device to build a greater sense of tension and release as we flow through the movement," Michael wrote in the notes he gave us. "Each subsequent section moves further away from the home key and displays increasing complexity, with each return to the home base of 'A' a different experience, having a heightened sense of resolution." That says it well, but what brought it home to me was his more real-world metaphor: Let's say Michael lives in Hollywood, and he drives across town to visit me in Pasadena. No big deal, he's home for dinner. The next time he leaves home, he drives five hours to San Francisco. Quite a trip! When he arrives home, he's pretty glad to be home. The next time he goes away, he flies all the way across the country to New York. He's far from home! He spends a while there, and when he gets back he really feels that sense of having returned. But the next time, he goes all the way to Argentina. What fuss, he needs his passport, has to go through security checks, eats completely different food while he's there, meets new people -- when he gets home, he looks at home in a whole new way. That's the "Rondeau" for you! If you are more curious and "if you want to really nerd out on Bach," (many of us do), here is a book that Michael McLean recommends: Bach's Works for Solo Violin: Style, Structure, Performance. After these lectures, a good number of people asked Michael if he could please do a harmonic analysis like this of ALL the Bach Sonatas and Partitas and perhaps have it published and sell it to all of us? I'll add to the chorus, Pretty Please? Perhaps someone with expertise in the publishing world could contact Michael and offer to help with that end of it? June 6, 2013 at 12:08 PM · Great post! My question is this: Was all this theory stuff around back in the day. I mean did Bach think about all this structure when he was writing, or did the music just happen and he wrote it down because it sounded good in his head? Is the theory all based on what Bach created, or was Bach the first one to take the theory to a new level? I don't really expect an answer because its a bit like language isn't it? There are rules and vocabulary and structure. Some people create beautiful things out of it and move it to new heights, others get overly jazzed on coffee and write meandering comments on violinist.com. June 6, 2013 at 05:47 PM · Bach probably thought about the structure SOME. (You really cannot write a proper fugue without thinking about it a great deal, actually.) I don't think he dialed in everything that we "find" in his works. The same is true of literature. If we notice a connection between Shakespeare and Chaucer, that doesn't mean the Bard put it there. By the way there is a pretty phrase near the end of the E major Gavotte en Rondeau (last measure of the last variation) that also appears toward the end (second-to-last bar) of the first part of the D minor Allemande. The two are off from one another by a half step. Perhaps this is a well known item but I actually found it on my own. So Bach recycled his ideas. Intentional or not? Laurie, this series of articles on the Symposium is just great! I am enjoying all of them. It's the next best thing to being there. Paul: if the Sonatas & Partitas were intended as a set, wouldn't it make sense to have some material that binds them together? June 6, 2013 at 08:30 PM · Yeah, that's what I was thinking too. It's really hard to imagine Bach would write that phrase a second time without knowing he had done so before. 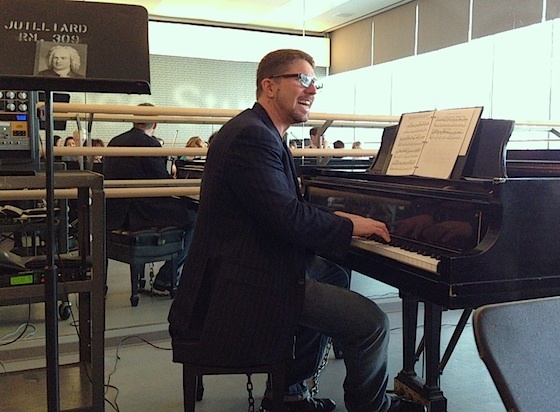 June 7, 2013 at 01:37 AM · Would you be that happy if you were chained to the piano bench? :) See the second picture. Explanation, please. June 7, 2013 at 01:57 AM · Lol, it does look like that! The piano bench (or maybe it's actually the piano) is chained into the room so it won't be removed. Michael, on the other hand, is free to come and go! June 7, 2013 at 02:21 PM · Anybody else inspired by the sheer artistic flair of Bach's curved beams? Even a non-musician should gain a spirit of optimism from following the flowing lines and the implied passion and joy of the composer. This is a work of art to behold as well as hear. BTW, Laurie, you have outdone yourself presenting all the details you have shared from the conference. Thanks for all the hard work! 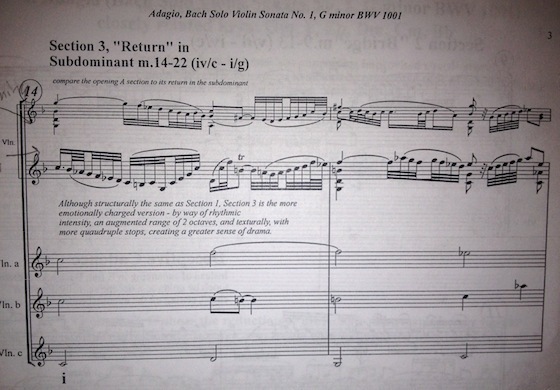 June 7, 2013 at 08:40 PM · I don't think Bach was thinking about correct voice leading while he was composing. Like you said, he just wrote what sounded good. I wish someone would write a book like that!! June 9, 2013 at 05:24 AM · No. Bach knew the rules well and followed them in a way that was genius. He was very well schooled, and practiced, in the music of his time. He absolutely was thinking about things such as correct voice leading, and his intellectual rigor is part of the reason he is so appreciated as a composer. And a note from me: Michael is a modern-day composer who has written all kinds of wonderful arrangements for violin. One way to support that is to buy his music! My students and I have particularly enjoyed playing his tango duets (there's also a Tango book for quartet that is really fun for gigs) and listening to Elements.